A copper alloy radiate of Carausius, dating to the period AD 286-293 (Reece period 14), ADVENTVS AVG, reverse type shows the Emperor on horseback holding a sceptre and raising right hand. Possibly Mint of London, - // (traces of M or L?). RIC V, pt 2, p. 464, cf. no. 10. 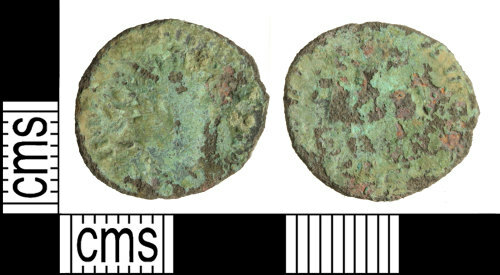 This coin has been included in Sam Moorhead's corpus for RIC.